When talking about the origins of GM’s early automatic transmissions, it’s important to understand that for the first seven decades of its history, the corporation was not nearly as monolithic as the modern enthusiast or historian might assume. Each division operated more or less independently and was largely autonomous, responsible for its own engineering, manufacturing, and sales. There were occasional collaborative projects, but in general, if the divisions needed something engineered or manufactured by another GM division, they had to buy it like any other customer. While each division did much of its own R&D work in those days, GM also had central Research Laboratories, headed from 1920 to 1947 by the inimitable Charles F. Kettering, famously the inventor of the automotive self-starter. The research engineers operated independently of the production divisions, conducting advanced engineering and research projects to develop technology (not necessarily automobile-related) that could be adopted by different GM divisions and/or licensed to outside companies. The Research Laboratories worked on all manner of projects, ranging from high-compression engines and leaded gasoline to hydraulic valve lifters. In the twenties, the work of the Research Laboratories was primarily on the theoretical and experimental side. If a particular invention seemed worthwhile, one or more divisions would be drafted (not always happily) to work with the research engineers to develop the idea for production. In 1931, the corporation organized a central Engineering Staff, led by VP of engineering Ormond E. Hunt, that could serve as a bridge between the research engineers and the divisions. However, ultimate responsibility for the production version of any specific concept or invention still (usually) rested with the individual division, which sometimes led to different divisions offering several distinct variations on the same basic technological theme. As you would expect, the Research Laboratories worked throughout the twenties to find alternatives to the dual-shaft transmission, exploring a wide variety of electromagnetic, hydraulic, and friction drive systems. These efforts took on some additional urgency after Alfred P. Sloan became president of General Motors in 1923. While he was no fan of engineering novelty for its own sake and had strongly opposed some of Kettering’s wilder ideas — such as the ill-fated “Copper Cooled” Chevrolet — Sloan was by his own admission a mediocre driver who could not use a conventional gearbox with any skill. Recognizing that there were many like him, Sloan understood that a reliable and effective self-shifting transmission would have powerful commercial potential. Cadillac became involved in this work in the late twenties or early thirties when the division was assigned to support Buick in the development of an ambitious infinitely variable friction drive transmission that the Research Laboratories’ Dynamics unit had conceived. (It appears the friction drive unit was based on one or more outside patents that GM had either purchased or licensed, although the scant information we’ve found on the design’s origins is confusing and contradictory.) Nicknamed the “Roller,” the transmission used two sets of toroidal races, one set driven by the engine, the other set connected to the output shaft; power was transmitted between the races by a series of adjustable rollers. The Roller’s development was protracted and difficult. The friction drive transmission was extremely smooth and potentially very efficient, but its mechanical complexity made it frighteningly expensive and its reliability remained at best suspect. Cadillac eventually withdrew from the development in favor of an entirely different project, conceived in-house by Thompson. It was just as well; Buick would never offer a production version of the Roller. Even with the Fluid Flywheel, the Wilson gearbox still required manual gear selection, but Thompson recognized that the combination contained most of the ingredients for a practical fully automatic transmission. Although the British automaker Daimler was the first to offer a fluid coupling on a production automobile, the fluid coupling (or fluid clutch) was by then more than 20 years old. It was first patented back in 1905 by Hermann Föttinger, a Bavarian engineer then working for the shipbuilder Stettiner Maschinenbau AG Vulcan, and became fairly common in marine applications after World War I. In the late twenties, the British engineer Harold Sinclair adapted the Vulcan fluid coupling for industrial and bus applications. It was the latter version, with some additional refinements by Daimler chief engineer Laurence Pomeroy, that became the Daimler “Fluid Flywheel” in 1930. As the vast number of related patents will attest, fluid clutches can have many possible variations, but at its simplest, a fluid coupling consists of two ring tori — torus-shaped discs — facing each other in a closed housing filled with fluid, usually some type of light oil. The inner surface of each torus member is covered with radial vanes that function much like the blades of a fan or a propeller. 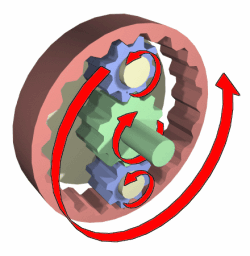 One torus member, called the impeller or pump, is driven by the engine. As the impeller spins, its vanes transmit that motion through the oil to the other torus member (called the turbine), which is geared or splined to an output shaft. The oil then returns to the impeller to begin the cycle over again. Once the force applied to the turbine blades by the moving oil is strong enough to overcome the turbine’s inertia (a point known as stall), the turbine and its output shaft begin to rotate. Unlike a mechanical clutch, a fluid coupling never transfers 100% of the motion of the flywheel; some of the input torque is always lost to friction heat (slip) within the moving fluid, just as a slipping plate clutch loses energy to friction between the clutch surface and the flywheel. Fluid couplings are particularly inefficient at low speeds because any time the impeller is turning significantly faster than the turbine, oil actually leaves the turbine with a rotational velocity opposite that of the impeller. 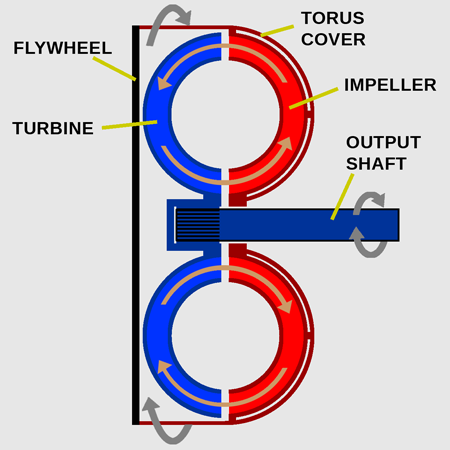 Slippage decreases as the turbine accelerates, allowing the coupling to reach an efficiency of 97% or better at cruising speed (when turbine and impeller speeds are nearly equal), but the only way the coupling will ever be 100% efficient is if the two torus members are somehow bypassed or mechanically locked together. The main drawback of a fluid coupling is that its slippage wastes power, potentially hurting both acceleration and fuel economy. Some bus and coach transmissions (and the postwar Packard Ultramatic and Borg-Warner DG) solved that problem by using a mechanical clutch to lock the flywheel to the transmission input shaft at cruising speeds, a feature that became virtually universal for torque converter automatics in the late 1970s. Hydra-Matic took a different approach, which we’ll discuss later in this article. In early 1932, Seaholm assigned engineers Ralph F. Beck and Walter B. Herndon to assist Thompson with his automatic transmission project, which was dubbed the “Military Transmission.” Although the project would eventually have military applications, the moniker was just a codename, intended — like the ominous “Keep Out” sign hung outside the door — to discourage prying eyes. The Military Transmission project’s objective was to develop a planetary gearset that could be operated automatically by means of hydraulic servos. The first fruit of this work, on which Thompson filed a patent in March 1933 (subsequently U.S. Patent No. 2,285,760), was a conventional sliding-gear transmission augmented by a two-speed planetary gearset that provided automatic shifting between direct drive and overdrive ratios. The design was similar in broad principle to the new Reo Self-Shifter, patented two years earlier and announced in May 1933 as a production option for the 1934 Reo Royale and S-4 Flying Cloud. For Thompson, the semiautomatic transmission appears to have been mostly an early essay in speed-sensitive hydraulic governor systems, suggesting the direction of his thinking. Around the time Thompson’s patent was filed, Seaholm expanded Thompson’s group from three engineers to five, adding William L. Carnegie and Maurice S. Rosenberger to the team. They soon began work on a more elaborate hydraulically operated planetary transmission, which had reached the prototype stage by mid-1934. Thompson applied for a patent on it that October. Unfortunately, the entire project was rapidly becoming an unaffordable expense. For several years, Cadillac general manager Larry Fisher had been spending lavishly on new products and new technology, including double wishbone suspension, power steering (which for various reasons Cadillac wouldn’t actually offer until 1952), and of course the V-16 and V-12 engines. The results were often impressive, but with Cadillac sales slumping badly as the Depression worsened, the division’s future was very much in question. Service manager Nicholas Dreystadt, who succeeded Fisher as general manager in June 1934, convinced the corporation to give Cadillac a reprieve, but severe budget cuts left the Military Transmission project hanging by a thread. By this time, Buick’s friction drive transmission had been canceled, so for Thompson’s work to go the same way would have been a significant setback to an effort that still had Sloan’s strong personal interest. The eventual answer was to transfer Thompson’s project to O.E. Hunt’s corporate Engineering Staff, which had its own facilities and budget. In January 1935, Thompson and his team moved to the central offices to become a corporate product study group, later named the Transmission Development Group. By this time, Thompson had developed a new four-speed semiautomatic transmissions, patent applications for which were filed in October 1934 and October 1935 (U.S. Patent Nos. 2,195,605 and 2,193,304 respectively). The transmission used two servo-operated planetary gearsets with an additional set of spur gears, interposed between the clutch and front gearset, for neutral and reverse. Thompson specified a conventional single-plate friction clutch, but it was strictly a stopgap. He still wanted to eventually substitute a fluid coupling, but his tiny team hadn’t yet had time to design a suitable one. The semiautomatic transmission’s rear servo (and thus the rear gearset) was controlled by the driver using a selector lever on the steering column, but the front servo functioned automatically, shifting from direct drive to reduction and back based on throttle position and road speed; the latter was signaled by a centrifugal governor driven by the transmission output shaft. The idea was that the driver would start in Neutral, disengage the friction clutch with the clutch pedal, and select Low for a first-gear start, followed in short order by an automatic shift to second. Obtaining third and fourth required shifting manually from Low to High (which did not require de-clutching). The transmission would then shift automatically between third and fourth gears. Some time after Thompson’s group moved to the Engineering Staff, their project came to the attention of Oldsmobile general manager Charles L. McCuen. We don’t know if McCuen was aware of Buick’s now-canceled friction drive project, but he was in any case very keen for Oldsmobile to have an automatic transmission of its own. He ordered Oldsmobile chief engineer Harold T. Youngren to work closely with Thompson’s group to adapt their ideas into something Oldsmobile could build and sell. Later that year, senior corporate management decided that the manufacturing portion of the equation should be handled by Buick, which had unused factory space that could be retooled for the purpose. Buick was also ordered to share the new transmission, presumably as a sort of consolation prize for the abortive Roller project. That directive sat ill in Flint; Buick engineers still had their own ideas about automatic transmission (some of which would be realized in the postwar Dynaflow) and had no love for the Automatic Safety Transmission, which they hadn’t developed and didn’t want. Throughout this period, Thompson continued to refine the semiautomatic transmission, applying for an additional patent in March 1937 (U.S. Patent No. 2,362,418). 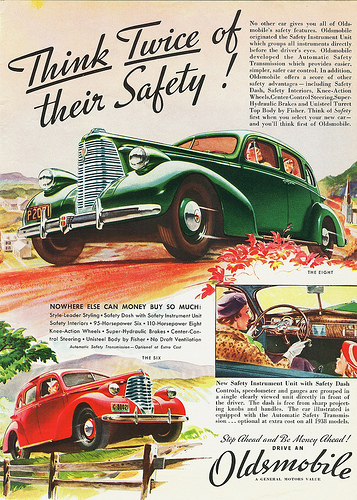 Production began around the same time and the new transmission, which Oldsmobile dubbed the “Automatic Safety Transmission” (AST), went on sale in June as an option for the 1937 Oldsmobile Eight. List price was initially $80, rising to a hefty $100 that fall, when availability was extended to six-cylinder Oldsmobiles and the Buick Series 40 Special. Buick doesn’t appear to have bothered coming up with a specific trade name for the semiautomatic, describing it simply as a self-shifting transmission, but it was otherwise identical to the Oldsmobile unit. Although the Automatic Safety Transmission is usually called a four-speed semiautomatic transmission, Earl Thompson’s patent disclosures actually describe it as essentially three separate transmissions in series: a synchronized dual-shaft reverse unit with helical gears followed by two separate two-speed planetary transmissions. In a car equipped with the Automatic Safety Transmission, the engine drove a conventional single-plate clutch, whose driven shaft drove the input shaft of the reverse unit. The reverse unit provided the driver with three choices: neutral, reverse reduction, or forward direct drive. With the reverse unit in gear, that unit’s output shaft drove the annulus (ring gear) of the front planetary transmission, which was surrounded by a brake drum connected to the planetary gearset’s central sun gear. A band brake could be engaged to lock the drum and thus the sun gear in place, putting the planetary unit in reduction. The drum also carried the driving plates of a multi-disc clutch pack, which could be engaged to lock the drum and the sun gear to the planetary unit’s planet carrier. The front unit planet carrier drove the dual sun gears of the rear planetary transmission, whose first annulus was connected to another brake drum and multi-disc clutch pack that could either hold the first annulus in place or else lock both the first planet carrier and both ring gears together to put the unit in direct drive. The second planet carrier drove the output shaft. * Although the front servo was released in neutral, the front band normally did not engage because no power was applied to the input shaft and front annulus. The Automatic Safety Transmission did not actually give the driver direct control of gear selection except in Reverse and Neutral. Instead, the selector provided Low and High ranges, which provided provided automatic shifting between first and second and third and fourth gears respectively. Automatic upshifts were triggered mostly by road speed, which was signaled by a centrifugal governor driven by the output shaft. However, a throttle-controlled mechanical linkage could either delay the upshift or force a downshift within certain speed ranges. Oldsmobile cautiously recommended starting in Low, but, as Thompson’s patent disclosures noted, starting from rest in High would actually cause the transmission to start in first gear and then shift automatically into third. Buick sales literature presented this as a feature, but it was really more of a known bug, resulting from a quirk of the hydraulic system layout. Idling in Neutral with the clutch engaged pressurized the rear servo, putting the rear planetary in direct drive (as in High range); this was intentional to facilitate push-starting. Disengaging the clutch, however, cut off power to the transmission oil pump (again by design) while moving the shift lever to the Low position dumped pressure from the rear servo. If you then started in High, it took a moment or two for the pump to build up enough hydraulic pressure to reengage the rear servo. Once it did, the rear planetary gearset would then shift from reduction to direct drive and belatedly put the transmission in third gear. As a result, owners seldom bothered using Low, whether the owner’s manual recommended it or not. First, third, and fourth were perfectly adequate for most conditions and not having to shift from Low to High was obviously more convenient, although the practice did the transmission’s reliability no favors. Oldsmobile advertising claimed that cars with the Automatic Safety Transmission returned up to 20% better fuel economy than did cars with the standard three-speed manual transmission. That claim, which in practice was rather optimistic (Buick claimed only 8%), was not due to the efficiency of the semiautomatic transmission, which consumed more power than did a conventional gearbox, but rather to the use of a significantly taller (lower numerical) axle ratio than was specified with the standard three-speed. Buick dropped the semiautomatic transmission after only a year and never offered the unit in their bigger cars, but Oldsmobile persisted through the 1939 model year, reducing the list price by $25 for the transmission’s final season. Total production, which continued through September 1939, was limited. We have no exact figures, but we’ve seen estimates ranging from about 15,000 to as many as 40,000. Buick took only about 3,000 of those for itself, so most went into 1937–1939 Oldsmobiles. Warranty costs were high and the Automatic Safety Transmission’s suggested retail price was considerably less than Oldsmobile paid Buick for each transmission, so Oldsmobile undoubtedly lost money on the whole endeavor. However, if nothing else, the project provided plenty of real-world experience for the fully automatic transmission Thompson and McCuen still hoped to offer. Even before Earl Thompson’s team started work on its semiautomatic and automatic transmissions, Armenian Oscar H. Banker (born Asadoor Sarafian) was developing his own automatic transmission concepts, applying for a host of patents in that area between 1927 and 1937. Banker’s transmission-related patents covered an assortment of two-, three-, and four-speed designs, some using spur gears, some using planetary gearsets, and some with a combination of the two. Unlike Thompson’s designs (or later Oliver K. Kelly’s), Banker’s automatic transmissions were controlled mechanically by one or more centrifugal governors rather than by hydraulic servos. Also, Banker mostly eschewed brake bands in favor of one-way clutches, a feature GM would adopt for the second-generation Controlled Coupling Hydra-Matic about 20 years later. According to Banker, he demonstrated a prototype of his transmission in late 1930 to O.E. Hunt, Larry Fisher, Ernest Seaholm, Thompson, and Charles Kettering. Banker claimed that GM’s New Devices Committee was prepared to license the design, but Banker’s business partner and financial backer, Franklin Magill of the Magill-Weinsheimer Company, wanted more money than GM was willing to pay. In 1934–1935, however, GM’s Yellow Coach subsidiary (the Yellow Truck and Coach Manufacturing Company) did briefly license one of Banker’s transmission designs, which was used under the trade name Monodrive (sometimes styled “Mono-Drive”) in a modest number of buses for the Chicago Motor Coach Company. Magill later secured a separate license agreement with Borg-Warner. The author is not an engineer or a lawyer, much less a patent lawyer, so we’re not qualified to weigh the legal merits of Banker’s later allegation that Hydra-Matic infringed his patents. While we don’t doubt that Thompson’s group was aware of Banker’s work and probably would have been even if Thompson and Banker had never actually met (it’s both customary and prudent to pay close attention to rival inventors’ published work), consciously developing a competing design does not necessarily constitute an infringement. The question of whether any specific elements of Thompson and Kelley’s transmission designs infringed Banker’s patents would have had to be weighed by a federal court. Since to our knowledge neither Banker nor his licensees ever pursued formal legal action, there seems little point in speculating on the potential outcome of such a case. That said, having examined many (though not all) of the patents in question, our layman’s observation is that Thompson and Kelley’s designs appear quite a bit different from Banker’s in both principle and operation. Furthermore, many of the broad similarities that do exist, such as the use of planetary gearsets, were already established in prior art. Neither Thompson nor Banker invented the epicyclic gear train, nor for that matter the idea of an automatic transmission — brothers Thomas L. and Thomas J. Sturtevant patented the first version of their centrifugally operated two-speed transmission in 1904, when Thompson and Banker were still children. A patent search on Banker’s name reveals more than a dozen patents related to automatic transmissions, but if you’re curious, the most pertinent are probably U.S. Patent Nos. 1,795,464 (assigned to Continental Illinois Bank and Trust Company, filed 21 October 1927, issued 10 March 1931); 1,795,465 (filed 26 November 1928, issued 10 March 1931); 1,843,193 (assigned to Continental Illinois Bank and Trust Company, filed 9 April 1930, issued 2 February 1932); and 2,262,747 (assigned to New Products Corporation, filed 18 September 1936, issued 31 January 1942, and reissued 18 May 1943).